My Very Own Pink ‘Finish Fairy’ Goes ALL The Way! Once upon a time, I thought faeries lived only in books, old folktales, and the past. That was before you burst upon our lives as a vibrant, luminous being, permeating our souls and our everyday existence, causing glorious havoc. You rock that those pink hot-pants, Finish Fairy! All the best for your race. Today is a big day in the running world in South Africa. Every year on Easter Weekend, runners from all over the world slip on their running shoes to run the Two Oceans Ultra or Half Marathon in Cape Town. This year a record field of over 25 000 runners were expected to line up for the Marathon, with the half-marathon, 21km’s, attracting the biggest field in the event’s history. The Two Oceans Marathon is in its 43rd consecutive run, the first race held in 1970 when 26 runners took part. As you can see this race has grown hugely since it first began. Up until now, Cape Town has still been enjoying beautiful warm autumn weather but today it has turned cold and wintry. Now I would not fancy running a marathon in the rain. In fact, I would not fancy running a marathon at all! But in the pouring rain, along with thousands of other runners, my good friend Paul, took to the road to run the half-marathon. But this was no ordinary run for him today. Today’s race took courage and belief in himself and a strong will to get to the finish line despite the odds! Keep reading I will explain…. The one thing I really like about Paul is that he is always game for anything! 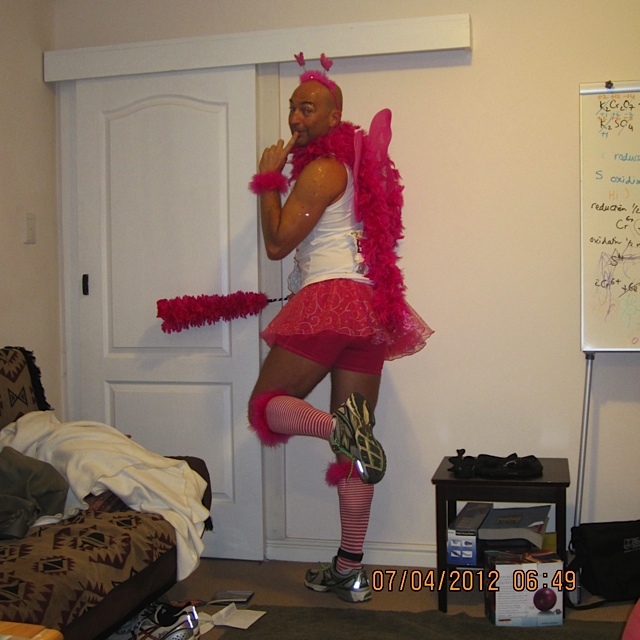 This year for the half-marathon he decided he was going to run it as a ‘Finish Fairy’. I realise most of you are frowning now and wondering what on earth a ‘Finish Fairy’ is. 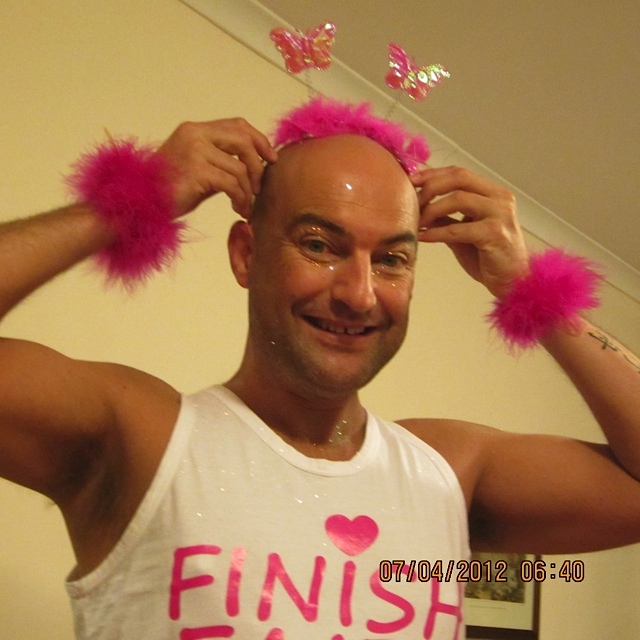 His idea was to dress in pink as a ‘Finish Fairy’ and help other people finish the race. I loved his idea! I knew he would sprinkle some of his fairy magic to fellow runners and spectators alike, leaving countless smiles and hope in his wake! It was going to be a great run! But that’s not the real reason I write this post today. There is so much more behind Paul’s run. It was about 24 days ago Paul got the go ahead to start running again. Read that again. T-w-e-n-t-y F-o-u-r days ago. Right, can we please have a doctor to check Paul’s head because I think he’s not well – Never mind running a half-marathon, running only 3 months after back surgery! His plan was to take a slow jog and spread some love while doing it. This is why I love my friend Paul! You see just over 3 months ago something went wrong with Paul’s back. Immeasurable pain, one day he landed up in hospital where he spent the next week before they operated. He lost feeling in one of his legs and he naturally worried about his future. You see, Paul is very athletic; he runs often and is often out doing trail runs. I visited as often as I could, trying to keep his spirits up as his family lives in Zimbabwe and except for an aunt or two here, Paul’s friends are his family here. Paul was never short of visitors as every time I arrived, one of his friends would be there. We had great chats in his hospital room, talking about cute doctors and joking about everything under the sun, while taking some time to talk about the serious things too. The nice thing was there was no limit to the visits and I could stay as long as I wanted and come anytime without anyone making any fuss. One day I was there they even closed the door to his room (to give us privacy no doubt) so we just went on with our laughter and chatting! Days before Christmas and about two days after his op, Paul was sent home to recover. The last three months was a long journey of recovery for him. He couldn’t do things he was used to doing and even sitting and standing had become a task all on its own! Paul also missed his running. So today was a really big moment for Paul. Early this morning he slipped on his ‘Finish Fairy’ outfit ~ pink hot pants, a pink tutu, a wand and pink and white striped socks up to his knees ~ and running shoes and lined up with the ‘B’ Class at the starting line. I visited him yesterday and as I left I asked him in what time did he expect to finish the race in. He said maybe 2,5 hours. He was nervous; many had told him he was mad for running so soon after such a big op. You could see their words were playing on his mind. He was questioning if he was doing the right thing. I told him to do what he feels is right. Most importantly, listen to your body and remember it’s okay not to finish. Do your best and if you need to stop, stop but most of all go and have fun! I told him I would be watching and supporting him from in front of my TV. FINISH FAIRY, dressed, sparkly and ready to hit the road! 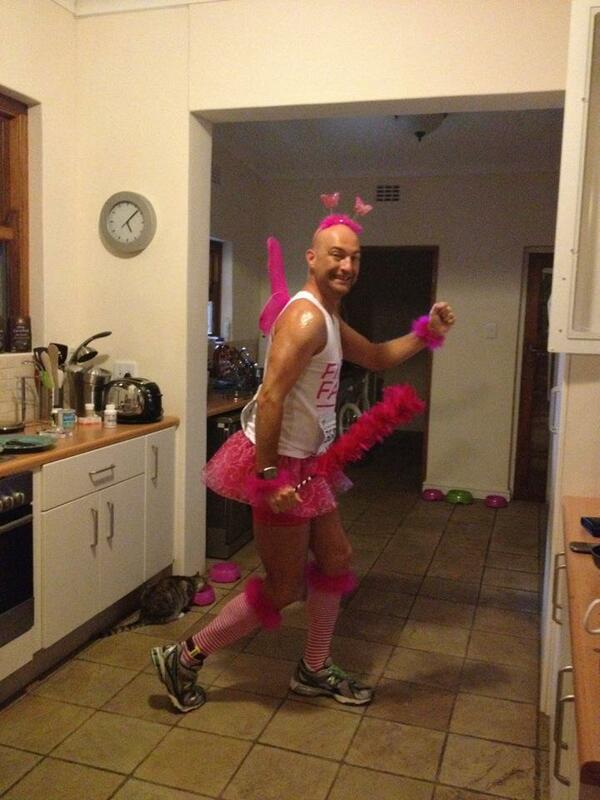 Paul, the pink FINISH FAIRY, warming up in his kitchen before the big race. I know how important it is for Paul to finish what he has started. I know how important it is for him to cross that finish line. I watched the 6am start time roll around, the runners were lined up and I could see the sign for where the ‘B’ Class was standing right behind the front-runners. I couldn’t see Paul but I knew he was there –6am struck and they were off. 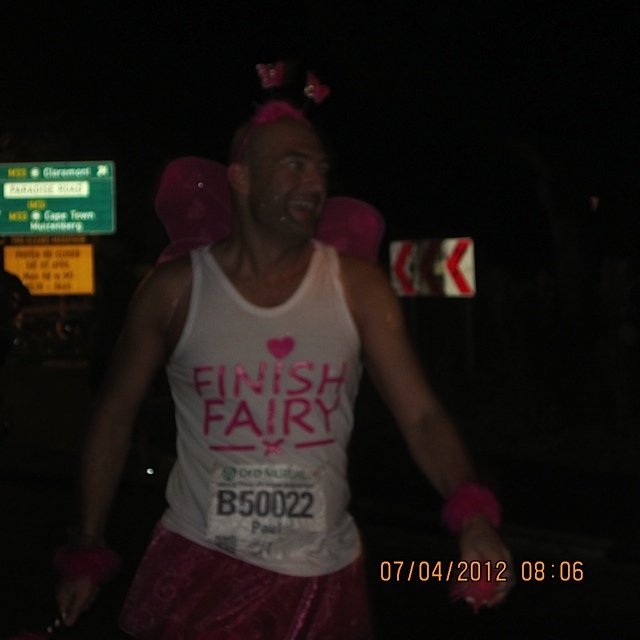 I watched closely and there was Paul to the right of my screen running in his pink ‘Finish Fairy’ outfit! I was so excited I clapped. I knew he was going to do it and he looked amazing! Paul finished the half-marathon in a time of 1h55!!!!! With virtually no training in the last three months, he had done it! He had made it to the finish line, bringing with him plenty of smiles and hope. Paul has been sharing stories with me this morning after he finished, ones of people’s reactions and even some of bum pinching! I mean seriously, who could resist stealing a pinch of this bum in pink hot-pants anyway?! No matter what we do in life, it doesn’t really matter if we make it to the finish line or not. What matters is that we gave it our best shot, what matters is that we at least get up and try and maybe, just maybe somewhere along the way we can give someone else hope to keep pushing forward. You gave someone that hope today Paul. You inspired them on. You inspire me on. Sometimes all we have to do it mix a little bit of foolishness with our plans. Like one of my favourite quotes says ““Mix a little foolishness with your serious plans; it’s lovely to be silly at the right moment.” Life is serious enough as it is, add in some laughter, lighten up and give it your best shot! FINISH FAIRY on the road, sprinking his magic, as he does best! 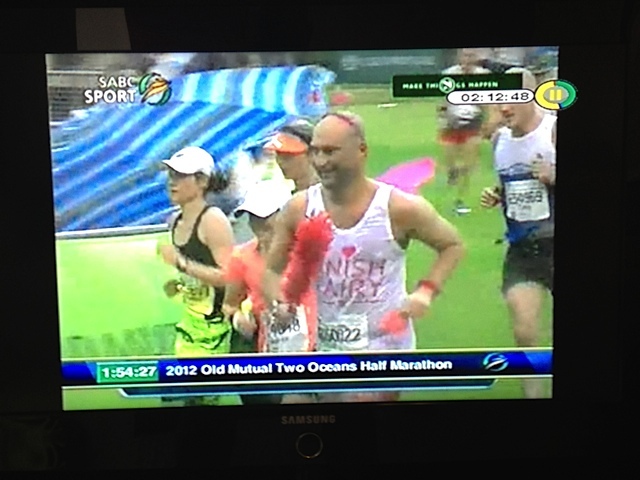 FINISH FAIRY caught on TV heading towards the finish line! I am so hugely proud of you today Paul! Congratulations and well done on a race well run! P.S. You make a great pink ‘Finish Fairy’ and today you almost got me feeling that I want to slip on some running shoes to do something crazy with you next year. Hahaha, nothing’s impossible…. but I do hope this moment passes soon! Previous A Wall, A Three-Wheeler & A Car Granny Would Be Embarressed By! Next From Slob to Exercise Junkie in Two Days Flat! Paul, you are amazing we love you so much and are so proud of you, you give so much of yourself to everyone you meet. Well done brother! Thanks for continuing to surprise and enthrall us.